After crossing under the Golden gate, we found a slip in a marina in Richmond, CA which is northeast across the bay from downtown San Francisco. We had planned to anchor out but the slips were only $17/night with showers and laundry facilities included. We couldn’t pass that up. We met another couple headed for Mexico on their boat S/V Soulstice, Steven and Jen, who are roughly our age and also enjoy great food and drinks and are on a break from their careers as flight nurses. Our friends Steve and Chelsea who we met in Coos Bay introduced us to their friend Greg (who is a professional chef and wine sommelier) from the Napa Valley who has a sailboat nearby. We helped Greg with some boat chores and in exchange he made dinner for us. Needless to say we ate well and had good (very good) wine. Steve and I crewed for a day on Greg’s boat touring the bay and taking in all the sights while he prepared meals and drinks for his private charter guests (more good food and wine). We got to sail through “The Slot”, a place famous for sailing in the bay where it blows 30 knots pretty much every day. Very exciting sailing! If you ever have a chance to see the San Francisco Bay from the water, don’t pass it up. We sailed next to Angel Island, Alcatraz, and anchored in front of Sausalito for dinner before dropping the guests off at a pier downtown. The following days we spent exploring the Richmond area and downtown San Francisco. In the 1940’s, there were four shipyards in the Richmond area and many more throughout the bay. They produced hundreds of ships in support of World War II, some completed in under four days, yes four days. Incredible. A small museum dedicated to those Americans that supported the war effort on the home front was a short walk from our marina. I’ll never cease to be amazed by the greatest generation of Americans that will ever live. 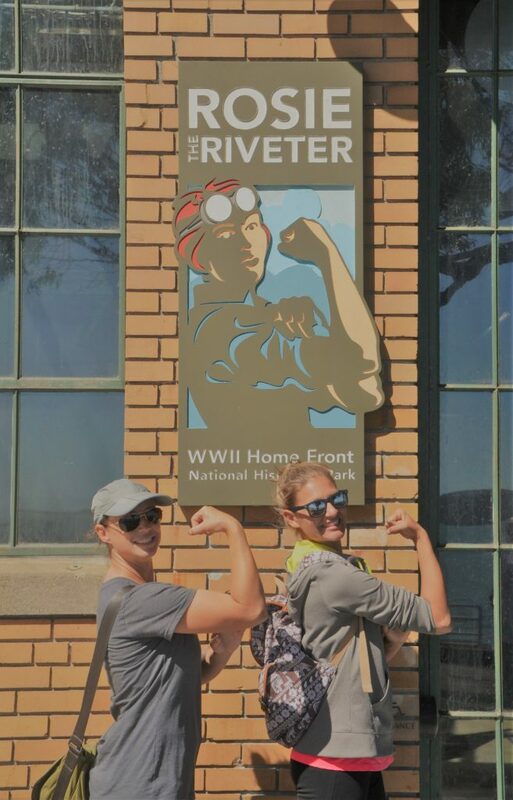 Sonni and Chelsea at the Rosie the Riveter museum. 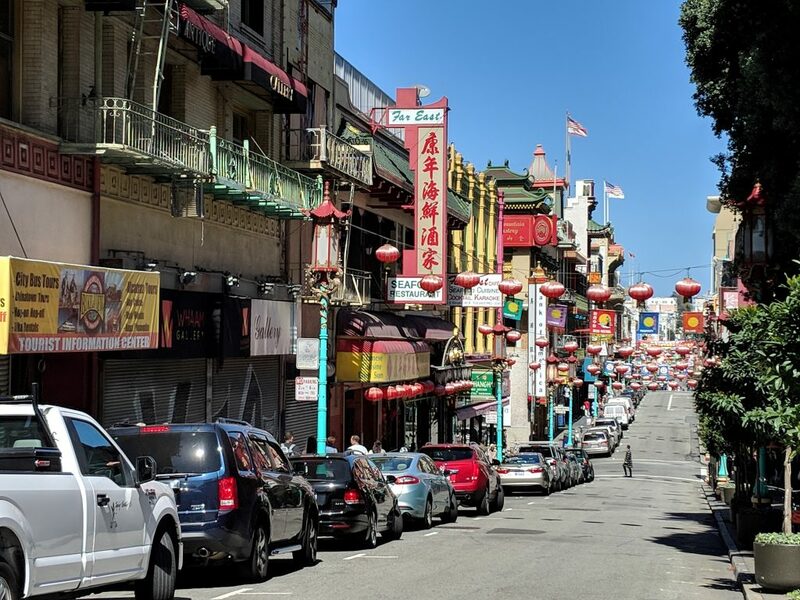 We couldn’t leave San Francisco without visiting the largest China Town outside of China or the historic wharf. The food in China Town was incredible. We put on around 13 miles and ate as many different Chinese dishes as we could find. After spending most of the day in China Town, we hot the tourist shops on the wharf and caught the public transit back to Richmond. We left San Francisco the next morning at the end of an ebb tide to minimize chances of rough seas and headed to nearby Half Moon Bay and anchored among the sea lions and pelicans. While these creatures are beautiful, they are very loud and extremely smelly. The pelicans paint the rocks white with a substance whose smell cannot be described. A small trade off for seeing these beautiful creatures in their own environment. 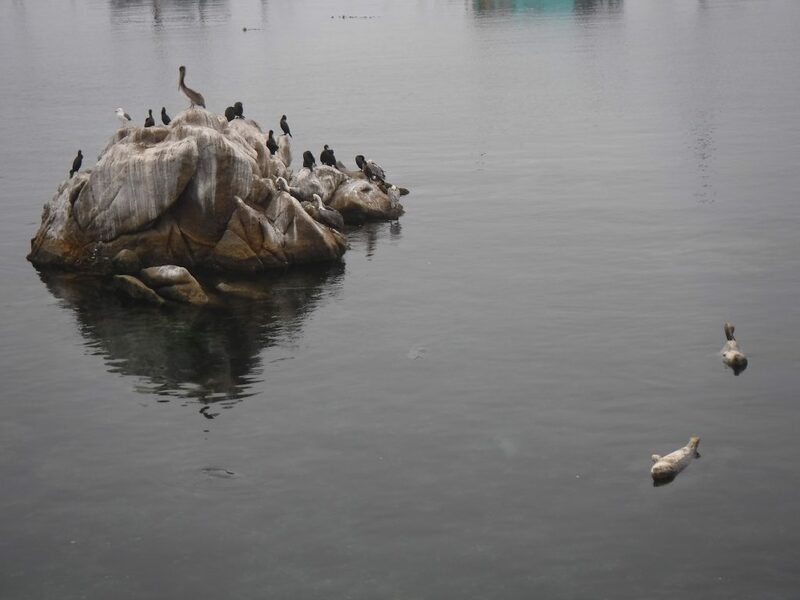 Fog bathing sea lions and birds waiting for fish to swim by. That’s not snow on those rocks. After a hike down the beach at Half Moon Bay and some more good food, we headed for the Monterey Bay. We spotted our first Great White Shark (sorry, it was too quick to grab a picture). It was about 8 feet long. We grabbed a mooring ball just off the pier at Capitola, a small town just East of Santa Cruz. Capitola was a small touristy town with lots of good food. The first night of sleep was not great. Waves came from the South, which is not common, and rocked the boat all night. The surfers enjoyed this unusual swell as it made for great surfing, we did not. We headed for Santa Cruz early the next day to get on solid ground and check out the sights. There were a ton of little skateboard and surf shops and you guessed it, more good food. We walked out the famous Santa Cruz Wharf, an old fishing wharf built in 1914 and still the longest wharf on the West Coast. Over a half mile long, quite a structure. After the long walk we had a giant Mai Tai and played a round of mini golf on the boardwalk at the Buccaneer Bay Miniature Golf Club since it was the only thing open on the wharf. The boardwalk was closed for the season except for a few shops and the mini golf (which was pirate themed and awesome). For the record, Brad is still terrible at putting but not quite as terrible as everyone else. 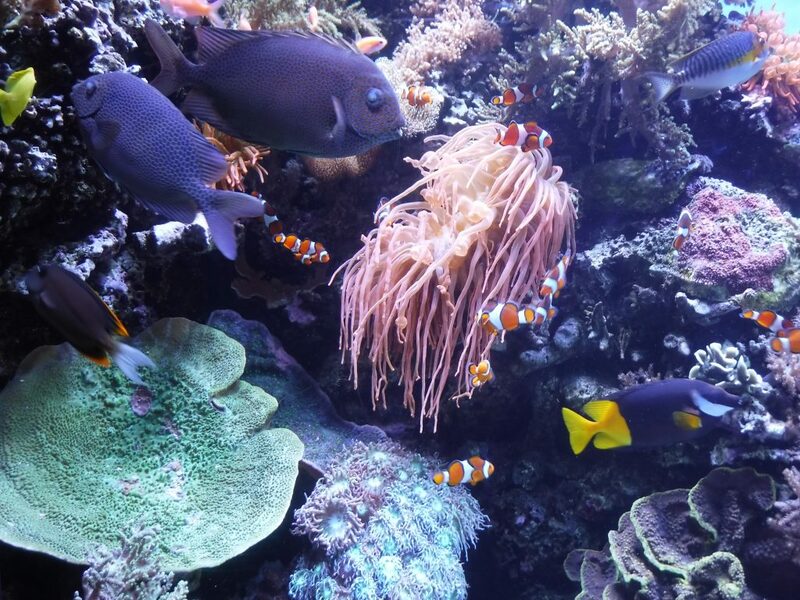 One of the hundreds of exhibits at the Monterey Bay Aquarium. 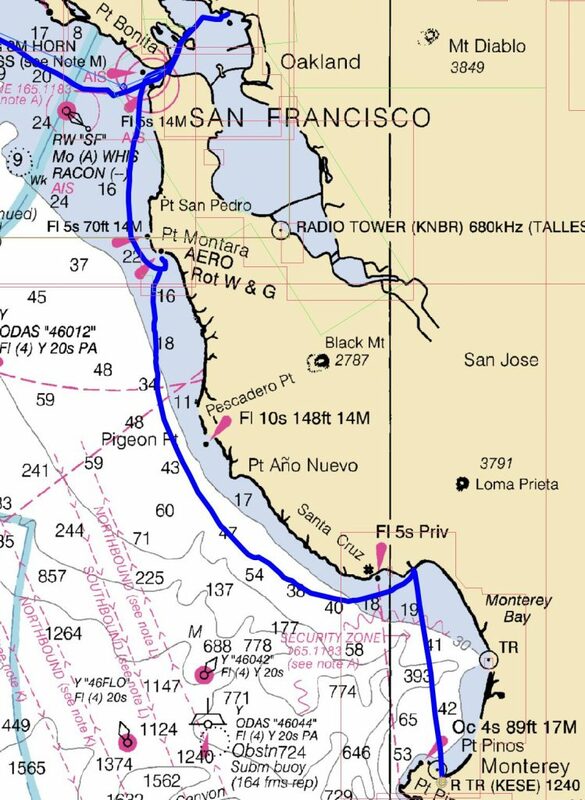 The next morning we left Capitola and headed 21 nautical miles South across the bay to Monterey. 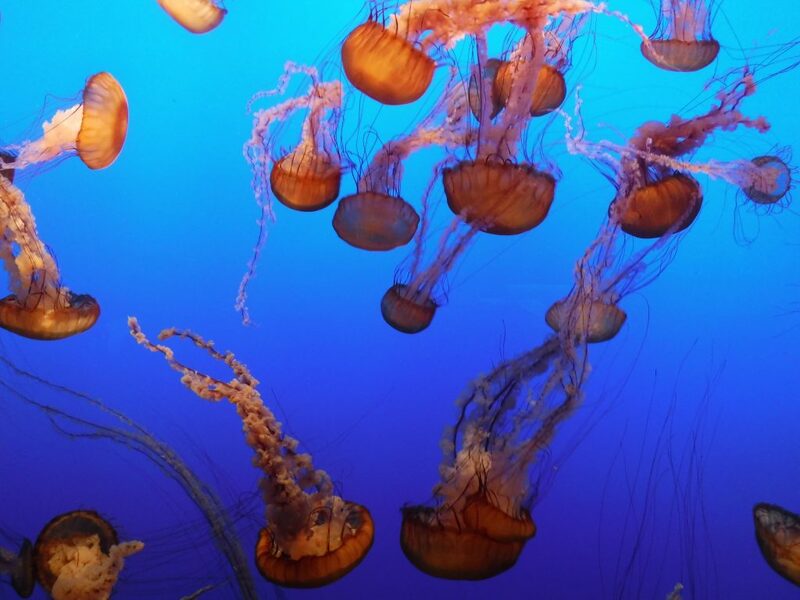 We visited the Monterey Bay Aquarium, world famous for it’s exhibits and work to protect the marine sanctuary in the bay. The exhibits were incredible. My favorite had to be the jellyfish. Tiny little aliens plucking the plankton from the sea. Fascinating. We’re off to Morro Bay next to visit some family and friends before heading south toward the Channel Islands. Until next time, thank you all for reading! Whale Spottings – Too many to count! Alyson’s great grandmother was named Rose and worked as a riveter during the war (in Michigan, I think.) She was interviewed and her story documented for a museum in California a few years ago. Just wonder if it’s the same one. Been looking forward to the next episode! Thanks stay safe.